The SAF is a product of the SPICOSA research project, funded by the European Commission from 2007 - 2011. SPICOSA stands for 'Science and Policy Integration for COastal System Assessment'. Its research was aimed at developing and testing a toolbox of methods for providing multidisciplinary and trans-disciplinary advice to environmental managers and policy-makers concerning environmental problems in the coastal zone, in order to improve the zone's ecological sustainability, economic efficiency, and social equity. Sustainability relates to the capability of an ecosystem to go on supplying humans with 'goods and services'. Efficiency is about making the best use of those resources for the satisfaction of human needs. Equity is about the fair distribution of such satisfaction. 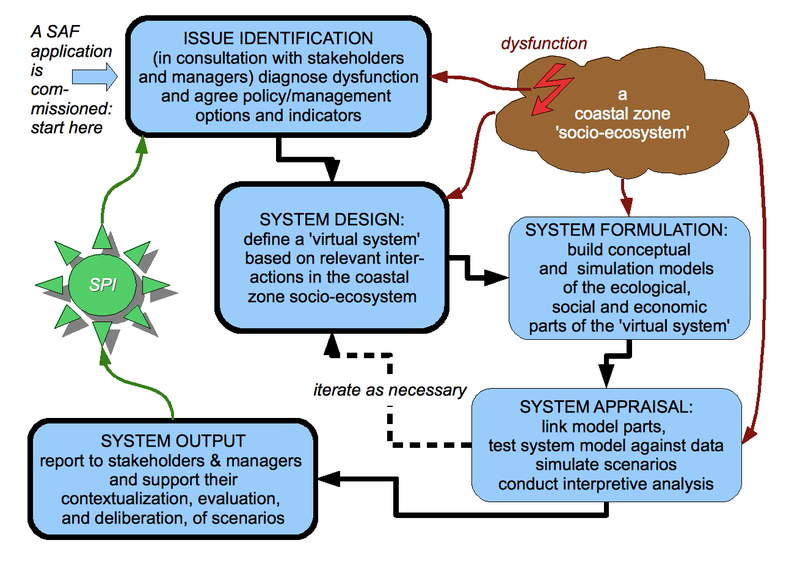 the use of General Systems Theory (GST: von Bertalanffy, 1968) and Soft Systems Methodology (SSM, Checkland & Scholes, 1990) to understand and model problems in coastal zones. 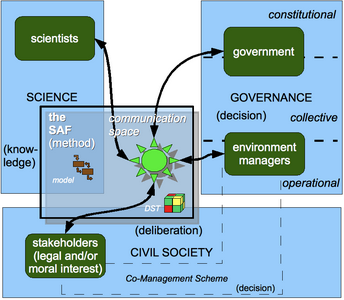 the engagement of stakeholders at the science-policy interface, as shown in the diagram. 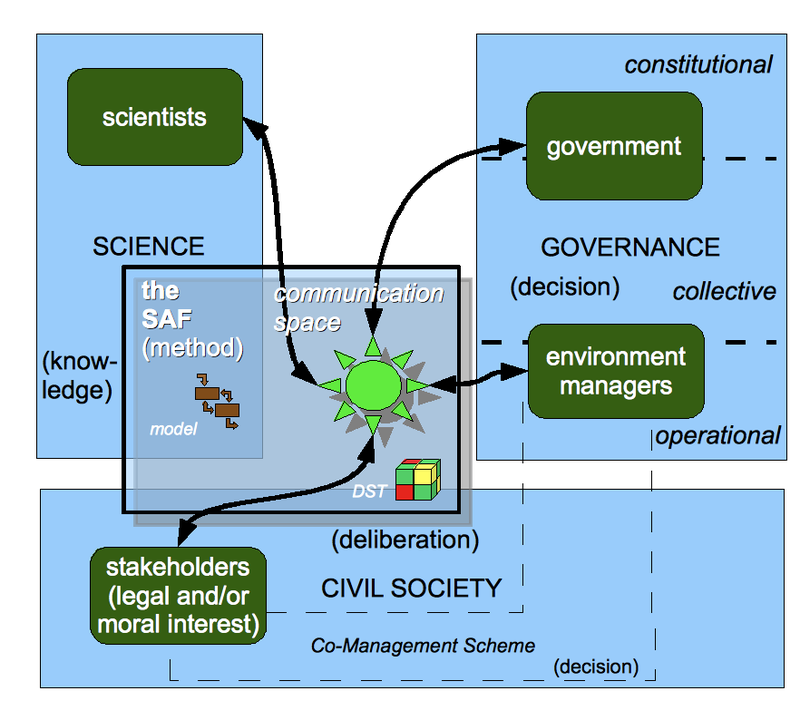 Both GST and SSM consider systems to be networks of components and links with certain formal properties; GST assumes the existence of such systems in the real world, whereas for SSM systems are merely ways to understand the complicated inter-relationships that exist in nature and society. 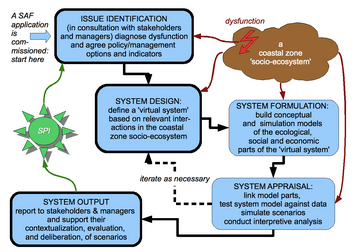 A SAF application includes the stakeholder-aided design of a 'soft' Virtual system, or conceptual model, that is simpler than the 'hard' real-world coastal zone system under investigation. System Output - stakeholders deliberate the scenarios. von Bertalanffy, L. (1968) General Systems Theory: Foundations, Development, Applications, New York: George Braziller. Checkland, P. B. and Scholes, J. (1990) Soft Systems Methodology In Action, Chichester: John Wiley and Sons, Ltd.